Cufflinks are a fabulous gift for the bride to give the groom as they can be worn on the wedding day and kept ever after to remind him of the best day of his life! 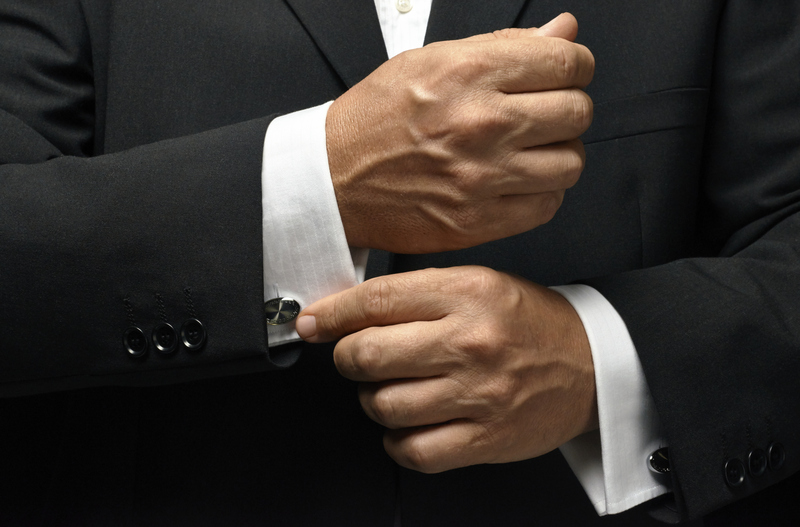 Here are some pointers for the bride on choosing cufflinks for the groom. Round cufflinks look like solid metal balls resting on the cuff and are a very versatile option as they can be teamed up with an elegant or causal outfit. Knot cufflinks may seem like an appropriate choice for a wedding, but they are generally a less formal choice and look best with a navy suit or a blazer and smart trousers, rather than with a formal wedding outfit. Geometric cufflinks come in a wide variety of designs, some incorporating gemstones and other materials, and are a great way to reflect personal tastes. Don’t get anything too trendy, however, unless you want them to go out fashion very quickly. T-back cufflinks are rather a formal choice and are best worn with a spread collar shirt and a tuxedo. They resemble a simple bar once they are positioned into the cuff. 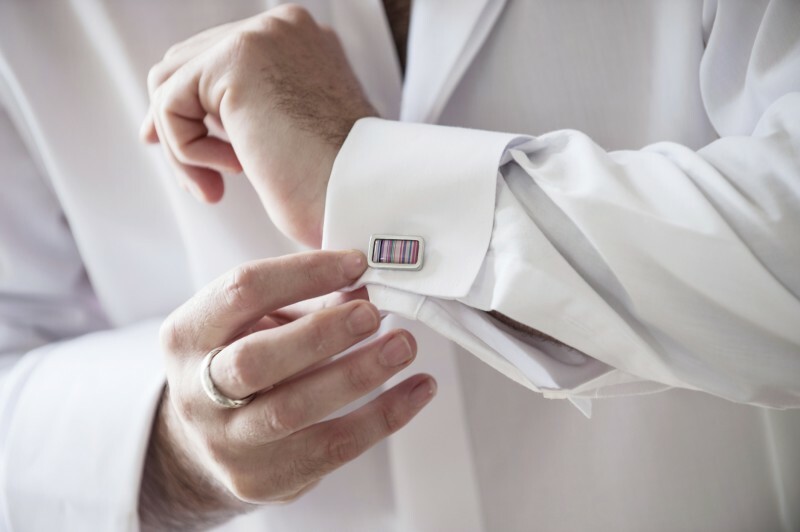 Many brides want to buy coloured cufflinks that will work with the wedding colour scheme, but this will limit the opportunities he’ll have to wear them again. Plain gold and silver cufflinks will always be a classic choice, and your groom is bound to keep them for years to come and wear them over and over again. Preferably choose cufflinks for the groom that are the same metal, or at least the same colour metal, as his wedding ring. If you are having a very laid back reception or a themed wedding, novelty cufflinks for the groom can work very well. You could choose cufflinks with the word groom on them along with a funny cartoon. You can also get matching novelty cufflinks for the other members of the wedding party with captions such as ‘best man’ and ‘father of the bride’ on them. Another example would be buying golf ball shaped cuff links if your groom is a keen golfer and you are getting married at a golf club venue. Whether or not novelty cufflinks are an appropriate for your groom depends on his tastes, the style of your wedding, and the budget you have for a gift. If you have agreed just to buy each other something funny, novelty cufflinks are perfect. These have a small rounded end that is pushed through the cuff, connected to the main cufflink face by a curved metal bar. They require the least effort to put on but they can slide back though the cuff and therefore get lost very easily. These have two similar sized faces that are connected with a metal bar or a short chain. They are the most formal style and look well with a tuxedo or morning suit. These have a bar attached to the concealed part of the cufflink which can be turned to be in line with the post as it is pushed through the cuff, and then can be locked at an angle, stopping the cufflink from falling out. They are usually thought to be the most secure type of cufflink. These are made of two separate faces that click together when inserted in either side of the cuff. They’re not great for thick cuffs as they can easily come undone and get lost.